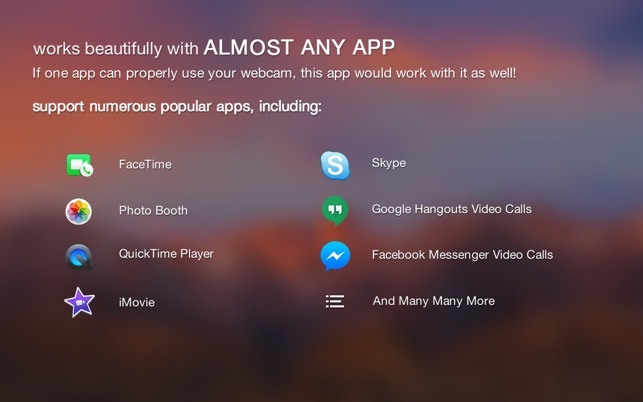 Freely adjust all webcam’s settings, so you’d look great when using FaceTime, Skype, iStopMotion, or other apps! 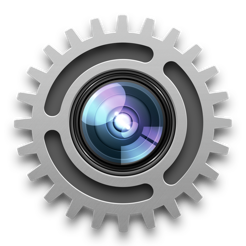 Webcam Settings Control allows you customize all settings of your webcam, including exposure time, contrast, saturation, white balance, & many more. 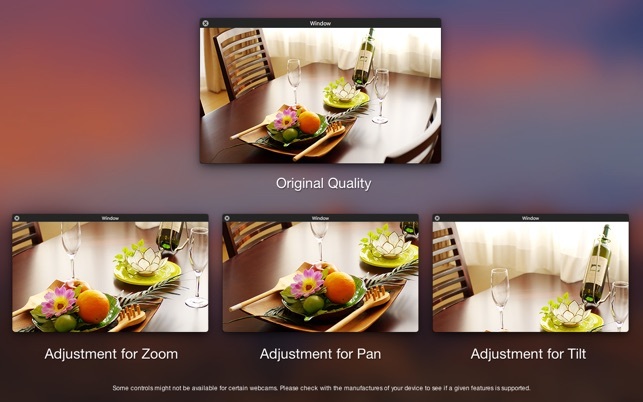 And you can adjust zoom, pan, tilt, and camera focus as well. It supports both built-in webcams like Built-in iSight, FaceTime/FaceTime HD Camera, and external USB webcams! 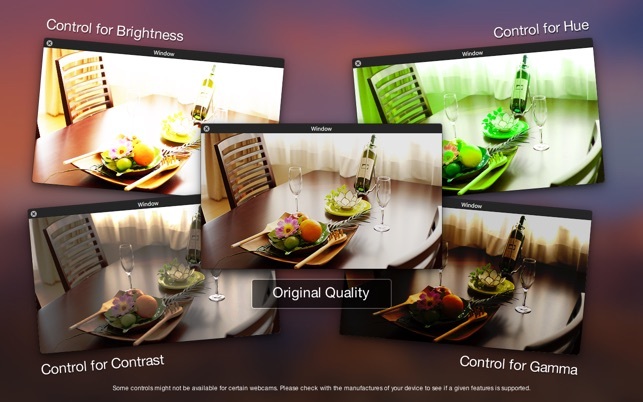 • Control Exposure, Contrast, Brightness, Saturation, White Balance & many other settings to improve video quality! • Use Zoom, Pan & Tilt to zoom-in on just your head and shoulders for a more professional appearance. 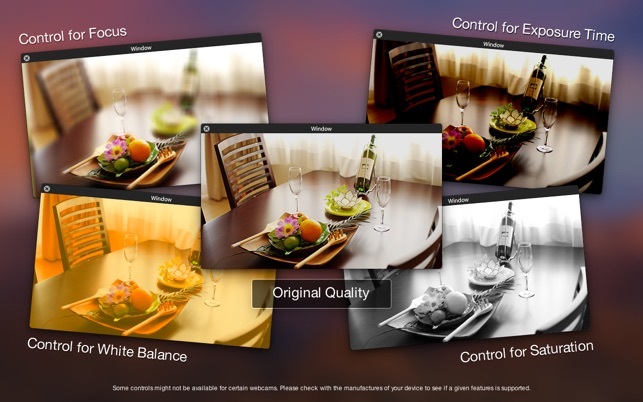 • Manually customize camera focus to maintain clarity all the time. • Supports both built-in webcams & external USB webcams. • View the results of all adjustments in Real-time as you make changes. All adjustments take effect instantly! • Save all current settings as presets for quicker access later on. • Reset all settings and restore everything to default anytime you want. • Directly communicates with the your webcam and control the device on a hardware level. Wish to manually change your webcam settings based on your needs, right? Especially when you have lighting problems, or want to zoom in for closer look. Then Webcam Settings Control is the app for you! If you have problems or questions about this app, please contact the developer at: gettechhelp@hotmail.com . * Webcam Settings Control only works with UVC (USB Video Class) webcams and built-in webcams, and doesn’t support FireWire webcams. * Some settings might not be available to all webcams. The device needs to have the related feature if you want to adjust a given setting. For example, if your webcam doesn’t support zoom, pan, and tilt, the controls for them would be greyed out. So please contact the manufacture to find out more device info. 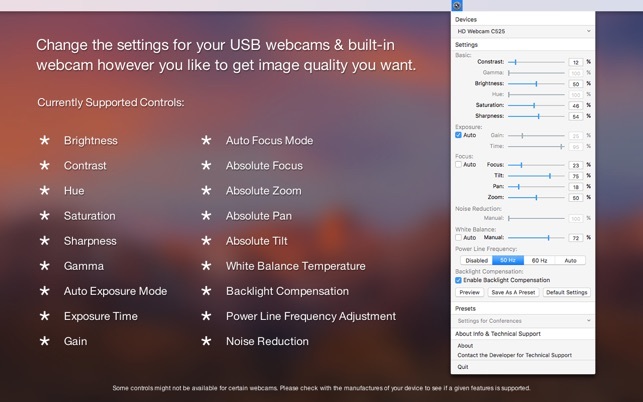 Most important settings like zoom focus and ... are not active for FaceTime HD camera on MacBooks. Zoom and Focus do not work. Wast of money! NO REAL SETTINGS as advertised.. Gamma dont work.. or backlight.. Waste of money..